With 175 paleo recipes and photographs throughout, this cookbook is a must-have for Instant Pot fans who follow the Paleolithic diet and want fast, healthy, and delicious meals the whole family can enjoy. Based on the diet of our ancestors, the Paleo diet is highly effective for losing weight and improving overall health. And now it’s easier than ever to create delicious, satisfying dishes using fresh and simple ingredients with the Instant Pot—the must-have kitchen appliance that can speed up cooking by almost six times while using seventy percent less energy than traditional cooking methods. In The “I Love My Instant Pot” Paleo Recipe Book, popular blogger and founder of Cavegirl Cuisine, Michelle Fagone shares how to make satisfying, whole-food dishes for every meal with the only device that can replace a slow cooker, rice cooker, and stockpot. "Full of great, easy paleo recipes! I seem to have less and less time right now to cook but thanks to [this] fun new cookbook that’s not a problem. This cookbook would make a great Christmas gift for someone with an Instant Pot, or one getting one for Christmas! There are no fussy cooking techniques and recipes that will keep your breakfast, lunch and dinner table hopping with effortless interesting food. You’ll love the recipes whether you are eating Paleo or not." "Perfect for those of you who are looking for paleo-friendly Instant Pot recipes. 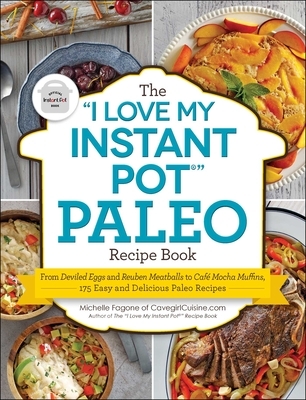 The ‘I Love My Instant Pot’ Paleo Recipe Book is another keeper by Michelle Fagone."